This field is thecenter of the most famous attack and defend game on the planet; “Castle Conquest! 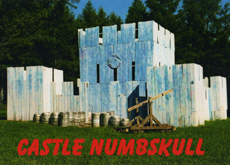 Castle Aaarrghh has a two story rampart entirely surrounding a full courtyard of barricades, buildings, and a three story tower command the center. 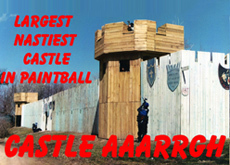 The front wall sports (2) new three story towers and the entire Castle has over 35,000 square feet of playing area. There are staggered walls mixed with doorways and windows throughout the lower walls beneath the ramparts. 4 ground level doorways and 2 gang ramps to the upper ramparts are the only entrances. The castle is also lighted for night play. Accept no imitations! Play CASTLE AARRRGH!. 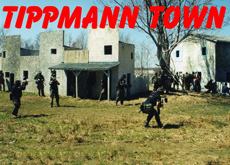 Tippmann town is just across the street from Castle Aaarrgh! This 5-acre town includes multiple two story buildings including a hotel and strip-mall, to go with various other buildings and structures. 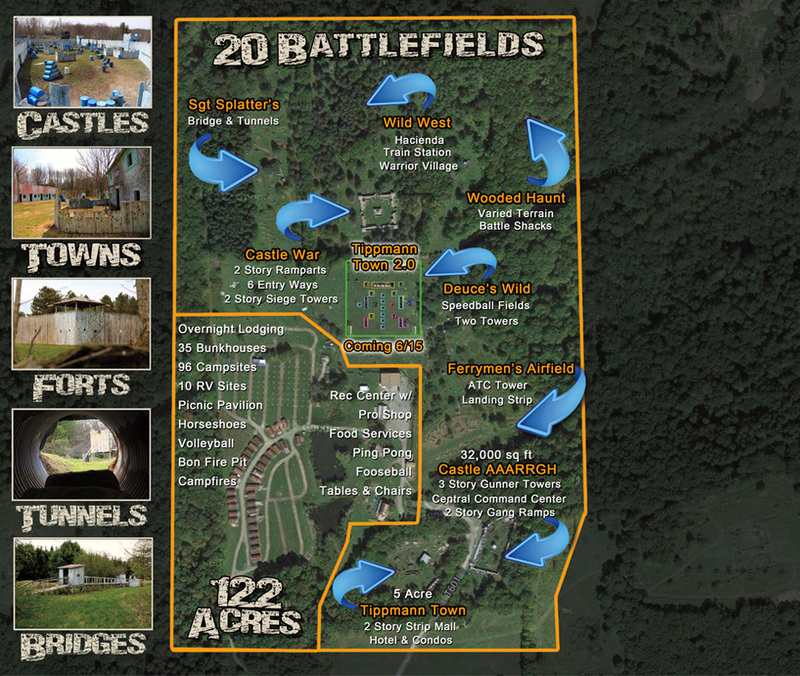 Fight your way through the streets of Tippmann town or duke it out in the buildings! This field is lighted for night play. Castle War is 128′ long per side with two story ramparts ranging from 8′ to 16′ deep that completely encircle the courtyard. Upstairs the ramparts have staggered walls and downstairs contain 17 buildings built into the walls. The courtyard contains several small buildings, barricades, and a Three-story 24′ square blockhouse in the center. Each corner has a staircase leading to the second floor and there are entrances from the outsidein the center of each wall and two Siege Towers that give access to the upper ramparts. 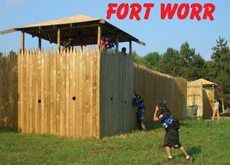 The Wild West is located behind Castle War and has a Trapper’s Camp with lean-tos and furs hanging, Miner’s Camp with a mine shaft andminer’s shacks, a Hacienda, Native American tee pee village, and a train station. Try and tame the Wild West if you dare! This two-story heated rec center houses a full Paintball Store, Registration Center, Food & Drink Services and paintball rental gear. The lounge area upstairs is complete with tables and chairs throughout with ping-pong, foosball, darts, Large TV and a stage where live bands perform during big events. 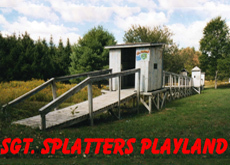 There is also a picnic pavilion with tables, chairs, and a gas grill and sink for anyone’s use. 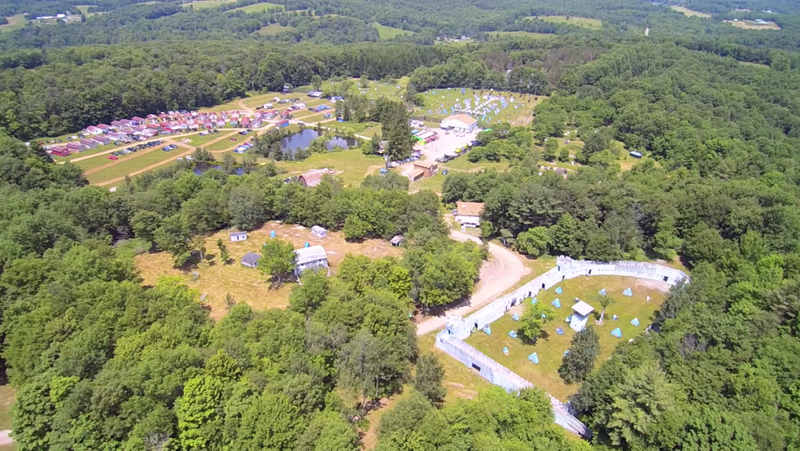 BUNKHOUSE Lodging costs $10 Per Person to stay in for the Entire Event if Paid For by 4/14/19 and should be reserved in advance with Pre-Registration to guarantee a spot. After 4/14/19 each bunkhouse spot is $15. To reserve Your Own Private Bunkhouse, the cost is $100 for the Entire Event if Paid For by 4/14/19 plus a Refundable $50 Deposit and should be reserved in advance with Pre-Registration to guarantee a Private Bunkhouse. After 4/14/19 it is $125 plus $50 Deposit. Each Bunkhouse is 15’ x 30’ with 8’ high ceilings and they have twenty-one 32” x 81” Wooden Bunks that are stacked three high along the walls. There are two windows for ventilation and lights in the ceiling. Most of them have one electrical outlet that is Strictly for charging Phones, Batteries, or running Sleep Machines. No Electric Fans, Coffee Makers, Electric Heaters, etc. are allowed. We recommend bringing Sleeping Bags, Pillows, and Air Mattresses/Sleeping Pad for your stay and if it is cold, a Propane or Kerosene Indoor Heater. NO FIRES ARE ALLOWED WITHIN 50’ of any Bunkhouse by Event Renters. 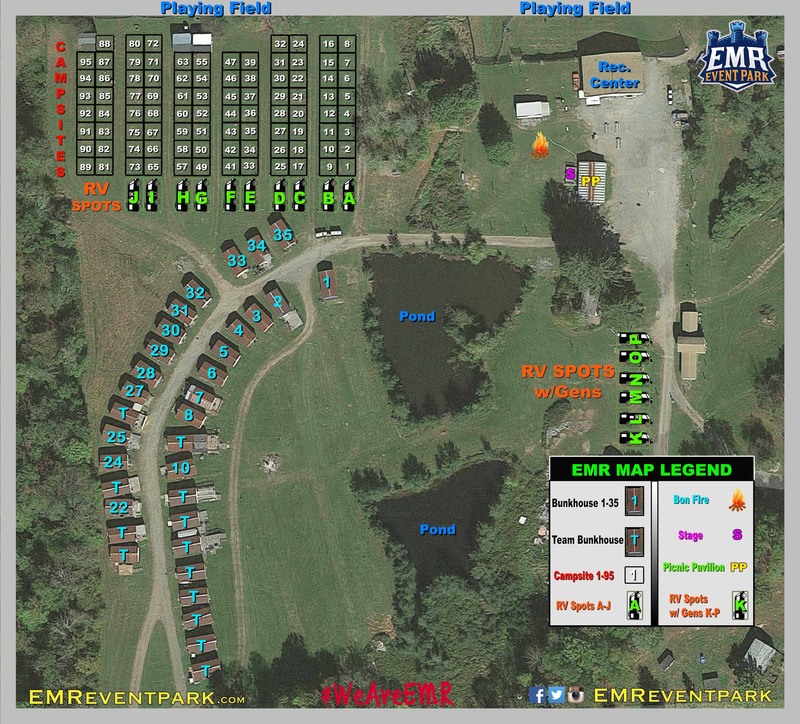 CAMPSITES for Tents and Campers are 20’ x 20’ and Cost $10 Per Campsite for the Entire Event if Paid For by 4/14/19. More than one site may be reserved at $10 Per Site. After 4/14/19 Each Site is $15. RV SITES are 20’ x 40’ and Cost $20 Per Site if Paid For by 4/14/19, however there are no water or electric hook-ups for the RVs. You must notify us if you wish to run a Generator past Midnight and if so, you will be assigned a spot apart from the Campgrounds. Walk-on players are not guaranteed Campsites or RV Sites. After 4/14/19, RV Sites are $30 Each.